Everyone here remembers how great New York Giants‘ Justin Pugh performed on the offensive line before ending the season with a back injury, right? 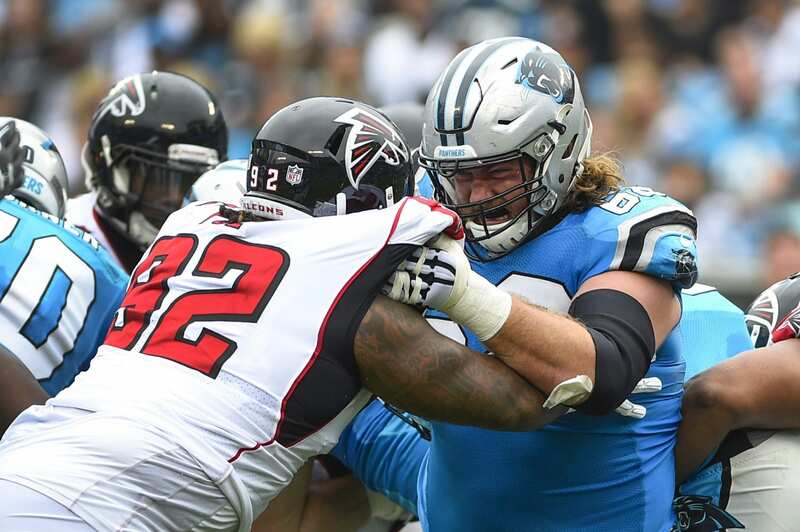 Well, imagine Pugh on steroids, and that’s what we are getting in All-Pro guard Andrew Norwell. For comparison’s sake, let’s check out their PFF grades. Of course, PFF often does an awful job grading out players, since Pugh only garnered a 52.4 while Norwell earned an 88.8. But, for shits and giggles, Norwell didn’t allow a single penalty or sack during the entire 2017 season. Impressed? You should be. The Giants, or specifically general manager Dave Gettleman, is about to splash some serious cash on Norwell (somewhere in the $12-14 million per-season range). The most enticing aspect of this signing is that we can officially confirm that the Giants are ‘finally’ committed to building through the trenches. If the Giants were to draft a quarterback and have him start behind a make-shift offensive line, it wouldn’t be good. Or, if they drafted Saquon Barkley and he didn’t have a single lane to run through… Disaster waiting to happen. The cap-space will become an issue with the signing of Norwell, as the Giants will only have about $10 million remaining. So, what should they do? Releasing players such as Brandon Marshall, Dwayne Harris, Ray-Ray Armstrong, and maybe even Brad Wing, can open up some serious cap-space to be used on another offensive lineman, linebacker or even cornerback. Additionally, it’s possible that guys like Dominique Rodgers-Cromartie take a pay-cut to open up more cap-room. It’s essential that the Giants address positions of serious need like linebacker and offensive line. We can assume that the positions the Giants fail to address in free agency, they will consider when the draft comes around. But for now, we can just enjoy the shiny new toy we are about to receive on the offensive line. Report: New York Giants To Resign Orleans Darkwa, But Why?